The phrase “taking a BC” refers to BC Powders, the iconic headache analgesic powder sold primarily in the South but stocked nationwide at Dollar General stores. BC is a mixture of aspirin and caffeine taken in powder form as an alternative to tablet pain relievers such as Tylenol. BC and its longtime competitor, Goody’s Powders, are now owned and manufactured by the same company. In college admission, “taking a BC” may now have taken on a new meaning. Several weeks ago, Boston College , often referred to as BC, announced that it will replace its early action program with early decision I and early decision II application options beginning with the 2019-20 admissions cycle. This marks the second time in two years that Boston College has changed its early-application plan. A year ago it moved from the restrictive early-action program it had used since 2009 to early action without restrictions (the only previous restriction was that students applying to a binding early-decision program could not also apply EA to BC). That change produced an unanticipated surge in applications. Boston College’s move to early decision is telling because it, along with its most common overlap colleges, the University of Notre Dame and Georgetown University, has been a stalwart espousing early action based on the belief that students should have until May 1 to make a final college decision. John Mahoney, vice provost for enrollment management at Boston College, has a reputation as one of the most thoughtful and principled people in our profession. He has proven his bona fides when it comes to not chasing application numbers, as back in 2013 Boston College added a supplemental essay that produced a 28 percent drop in applications without hurting yield or quality. If Mahoney and Boston College feel the need to go down the early-decision path, that raises questions for all of us. It is easy for the cynics and conspiracy theorists among us to see Boston College’s move as all about manipulating admit and yield rates, but I am interested in the larger implications of the decision. What are the factors and issues that have led Boston College to go down the early-decision path? One is confusion between restrictive early action and single-choice early action. 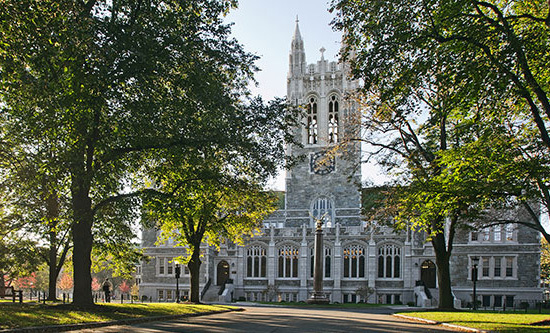 BC’s original early-action plan was restrictive, prohibiting students who were applying to a binding early-decision plan from also applying to Boston College in early action but allowing students to apply to other EA programs. That policy was similar to the policies in place at Georgetown and Notre Dame. According to Mahoney, Boston College became worried that students applying using the Common Application were interpreting BC’s policy as single-choice early action, the policy used by places like Harvard, Princeton and Yale Universities that prohibits students from applying to any other private institution’s early-action program. That particularly impacted those students who might apply early action to BC, Georgetown and Notre Dame. Single-choice early action is the most confusing of the admission plan definitions allowed by the National Association for College Admission Counseling. NACAC has historically defined the difference between early decision and early action as binding versus nonbinding. I have argued before that the distinction should actually be single choice versus multiple choice, that single-choice early action is really nonbinding early decision. Either way, it’s confusing. A year ago, Boston College dropped the restrictions on applying early action, with the only substantive change that early-decision applicants elsewhere could now apply EA to BC. That simple change resulted in a staggering 54 percent increase in EA applications. That means either that the BC early-action pool included 5,000 applicants who were also applying early decision elsewhere or that removing the word “restricted” opened the floodgates. In any case, the increase in applications strained BC’s ability to read those applications in a timely and meaningful way. That raises the question about whether there is a point at which increasing application volumes is no longer a good thing. Application numbers are seen as a metric, and admissions offices are under pressure from presidents, boards and bond-rating agencies to constantly increase application numbers. But is there a downside? I am seeing more instances of lost or misfiled documents, and one of college admission’s ugly secrets is how little time is spent reading applications. There have been calls to end early decision for years, and many in the profession thought that the move away from ED back in 2006 by Harvard, Princeton and the University of Virginia was the beginning of the end for the practice. But there were few followers, because early decision works well for too many institutions. At a fundamental level, there is nothing objectionable about early decision. It involves a moral contract between student and college. The student applies early and commits to attend if accepted in exchange for an early decision, a decision that can simplify the admissions process. The college commits less but benefits more. It doesn’t limit its option to admit, defer or deny but knows it will have a yield of one for one for an ED applicant rather than the one for four or one for five yield in regular decision. That is not to say there aren’t legitimate criticisms of early decision as a concept. It most benefits students who are already privileged by virtue of attending schools with savvy college counselors. It can penalize students with financial need, although the ability to complete the FAFSA with prior-prior year tax information has lessened that issue. Today what is most problematic about early decision is its use as a tool to manipulate student behavior. Colleges that admit a higher percentage of applicants early are being subtly coercive, using a variation of “if you order now.” More troubling is the number of institutions that admit a huge percentage of their freshman class, as high as 60 percent, through early decision (Boston College plans to hold its ED percentage to 40 percent). That benefits them by driving the regular admit rate down, but it also drives students and their counselors to adopt an application strategy that includes an early option. That strategy is risk-reward, because if a student uses his or her early chip at one college or university and is unsuccessful, the odds of admission at other comparably selective institutions during regular admission drop dramatically. There are two other arguments advanced by Boston College for its move to early decision. One is that ED will allow it to enroll more "best fit" applicants for whom BC is their first choice. I don’t have any problem with that justification. I like having colleges talk about fit, and I think it is legitimate for colleges to want to enroll students who want to be there. Using early decision is a better way to measure interest than making assumptions about depth of interest based on who opens an email and for how long. The other contention is that early decision meets the “growing preference of today’s high school students.” I’m less sure about that claim, but wonder if it is an unintended consequence of the acceleration of the application process. Have earlier deadlines and the increase in early options created a monster for students who have grown up in an instant gratification world? Is regular admission an endangered species? And what is the impact on the senior year in high school? Thinking about all of this is enough to give one a headache. I may need to take a BC (the powder, not the college). Jim Jump is the academic dean and director of college counseling at St. Christopher's School in Richmond, Va. He has been at St. Christopher's since 1990 and was previously an admissions officer, women's basketball coach and philosophy professor at the college level. Jim is a past president of the National Association for College Admission Counseling.